Flat and hollow cuttings developed during the seventeenth century from the lapidary techniques used by gem cutters in central Europe from simple bullseyes (olives, almonds, punts, printies) to the more complex hollow diamonds, hollow hexagons, and scales(shields). Imported to England early in the eighteenth century, hollow cutting has been popular ever since. To avoid confusion with motifs made by the V-shaped miter wheel, diamonds and hexagons in this group should always be referred to as hollow diamonds and hollow hexagons. Elville (1953, p. 25) provides the following series of sketches that demonstrate how hollow diamonds are cut. First an array of oval bullseyes (punts, printies) is cut (A). Then, a second array is cut over the first (B), partially obliterating the outline of the first array and resulting in a pattern of hollow diamonds as indicated by the heavy lines in sketch (C). By varying the shape of the bullseyes and the spacing between the rows and columns in each array, different hollow motifs can be produced. For example, one particular combination will produce hollow hexagons, another will result in a scale- or shield-like motif. British glass cutters usually refer to the four-sided hollow diamond motif as “hollow (or shallow) diamond cutting” and the six-sided hollow hexagon motif as a “hexagon cutting” or “honeycomb” (Newman 1977, pp. 152-3). The situation in this country is somewhat more complicated. For example, the term hollow diamonds has been used to refer to hollow hexagons (e.g., by T. B. Clark & Company). And the hollow hexagon motif has been called, variously, St. Louis diamonds, Dutch diamonds, and honeycomb. Unless a proprietary name is available, it is recommended that, at least in formal discussions, geometric names — such as hollow diamonds and hollow hexagons — be used, and names such as St. Louis diamonds and honeycomb be avoided. A champagne glass (“flute”) cut with hollow diamonds. Its waisted stem (sometimes called a “French stem”) has an air trap and is flute cut (paneled). Ground and polished pontil, c1870. H = 7.5″ (19 cm), rim D = 2.1″ (5.3 cm). Set of six sold for $225 in 1987. 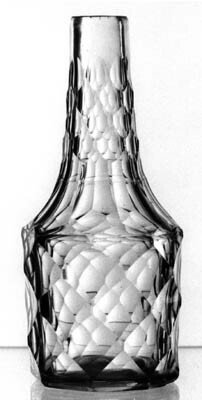 Flutes on the shoulder of this cruet bottle act as a bridge between the hollow hexagons on the body and the scale cutting (shields) on the bottle’s neck. (The hollow hexagons on the body are, in fact, closer to being hollow diamonds than hexagons.) Colorless, lead glass. Base is ground flat. Remarkably similar to bottles — with sterling silver caps — in a cruet set made in England, 1750-70, now at the Winterthur Museum (acc. no. 75.269); shown in Palmer (1993, item no. 239). H = 6.25″ (15.8 cm). Sold for $45 in 1996.